My fondest memories of childhood were not those of solitary pursuits. Not having someone there to share an otherwise awesome event seems to take the edge off the experience. Maybe it’s because I simply want to say, “Hey, look at that!” and feel the satisfaction of having another appreciate and later reiterate the experience. Frequently, it works the other way. So many times I might have missed what another pointed out or interpreted. One Spring I attended a week-long medical refresher course at the YMCA of the Rockies in Estes Park, Colorado. I invited my parents to join us, and they flew to Dallas. 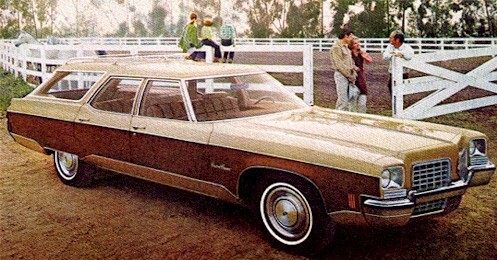 Mary Lou and I and our four children set out with them in our 1972 Oldsmobile Custom Cruiser station wagon. Despite the demands of the curriculum, we found time to walk the trails and see deer, beavers, American Dippers and a family of Blue Grouse (now known as Dusky Grouse). We had followed a direct route to Colorado, but after the conference I took leave for a few days to permit a more leisurely trip back to Texas. On the return leg, we spent two nights at Kachina Lodge in Taos, New Mexico. The first night we watched Pueblo Indian dances, and the next morning we attended Sunday Mass at San Francisco de Asis in Ranchos de Taos. This adobe church, completed in 1815, is said to be the most photographed church in America. 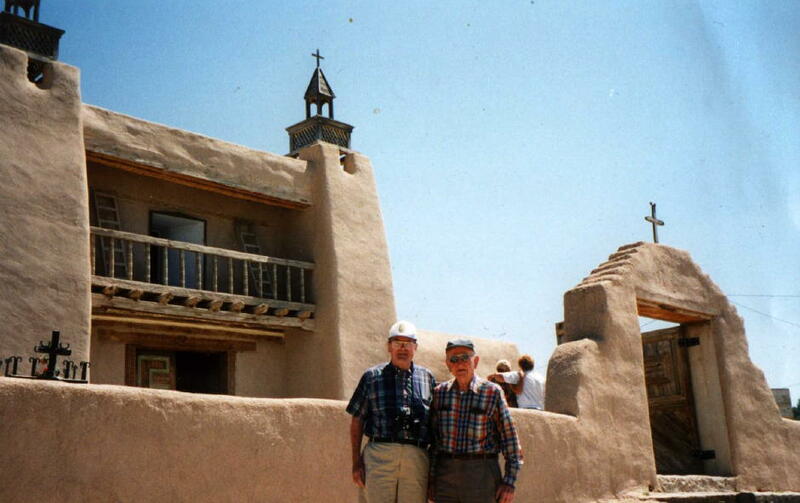 (Dad loved the old churches of New Mexico. The photo shows him, on the right, with his brother, Father Dan, on the High Road to Taos, visiting the church at Truchas/Las Trampas). The ceremony was entirely in Spanish. It happened to be Father’s Day. The priest invited all fathers to join him on the altar to recite the Lord’s Prayer. Dad and I walked up and joined the congregation in prayer. I knew some Spanish, but Dad knew none. That did not dissuade him. He put his hand on my shoulder and launched into the Latin version of the prayer. While everyone else was saying “Padre nuestro que estás en los cielos, santificado sea tu nombre…” Dad was confidently announcing “Pater noster qui es in coelis, sanctificetur nomen tuum.” The Romance cadences were so similar that no one seemed to notice. That Father’s Day and all others afterwards held special significance for me. During my working years I enjoyed beating the traffic and getting to the office early. I was able to close my office door and organize my day in peace and quiet before my co-workers appeared. When I retired from active duty I resolved never to sleep late. Therefore, when we moved to the mountains of New Mexico I set the alarm on my watch for 7:30 AM to nudge me awake just in case, but I rarely needed it. Dawn came quick and bright as the sun emerged in a blue sky above the ridge to the east. So it happened that on Sundays, 7:30 AM Mountain Time was an ideal time for me to call my father, back home in New Jersey. 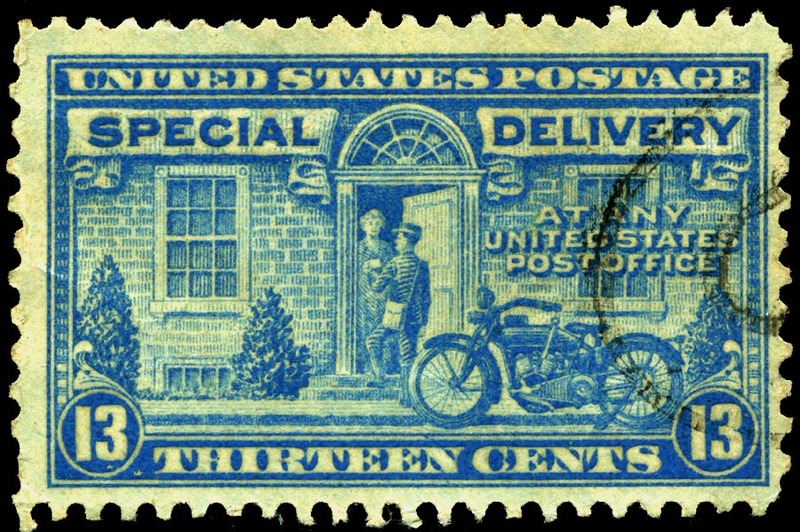 By then he had returned home from early Mass and had finished his breakfast, and was in the middle of his morning papers. The chirp of my watch alarm was a gentle reminder, and rarely did I miss placing the call. If I happened to be a little late, he would ask about the reason for the delay. At Dad’s funeral, his younger brothers told me how important those calls were to him. Unbeknown to me, he arranged his Sunday morning schedule to accommodate my call. We talked about nothing in particular, though we often filled the greater part of an hour with banter. Embedded among discussions of the weather, politics and sports were those “I wish you could have seen…” and “Remember when we…” moments that swept us back to those earlier days. I last called Dad only a few days before he died. He spoke of how wonderful it was to have a hospital room with a view. Now in the Eastern Time Zone, my wristwatch still chirps at 7:30. Though two hours earlier in real time, the sun already dapples on the surface of our lake. And I whisper a Pater Noster in remembrance. Yesterday, I set out some New Guinea Impatiens to fill the space in our planters created when I removed the tomato plants. Shortly afterwards, a three-foot long Green Iguana appeared on our patio. These exotic reptiles, native to Latin America but descendants of released pets, are quite common in our parks and in established neighborhoods that have large trees. They are usually seen climbing on larger branches or sunning themselves along canals. This was the first Iguana I have seen within several miles of our home. The trees in our neighborhood are less than five years old. Of course, the Everglades start only a quarter of a mile from our home, and these creatures like to follow waterways. They are excellent swimmers, and account for many “alligator” sightings. Vegetarians, they particularly like hibiscus and impatiens flowers. Perhaps this one smelled some fresh salad. After I took several pictures of the reptile, it ambled off. The Green Iguana represents but one of the 279 species of exotic wildlife (196 species of birds, 31 terrestrial mammals, 4 amphibians, and 48 reptile species) reported in Florida. An exotic species is one that was introduced by human activity and is free-ranging in an area to which it was not native before European settlement. According to Florida Fish and Wildlife, 107 exotic animal species have been breeding here at least 10 years (but not necessarily consecutive years). In addition, thirty-two (32) species of exotic freshwater fishes are currently reproducing in Florida freshwaters, more than any other place in the world. “Green iguanas are an essential part of their native habitat, as are all organisms. As juveniles, they make a tasty meal for many predators. As adults, their fruit-feeding activities may help spread seeds in the habitat. Adult iguanas are not at risk from many predators, as they can defend themselves with sharp teeth and strong tails. If they make it to adulthood, they can be expected to live for 10-15+ years. There is one predator that the iguana is no match for, however – humans. “Native people often refer to green iguanas as “the chicken of the trees”, or “bamboo chicken”. Green iguanas are harvested for their skin, meat and eggs. The time of year for iguana mating season varies from region to region, but it tends to fall in the months of January and February. Wild, gravid females are captured and their eggs are collected for food and to supply “iguana farms” with babies for the pet trade. While small-scale hunting is not a threat to iguana populations, large-scale harvesting, particularly to supply the pet trade, is.